If we have an especially large haul of these lovely morsels, I clean, slice and oven-saute them in large baking pans, and then freeze them in 2 cup containers. This preserves their flavor the best, I think. (I don't really like them dried.) I often use these frozen chanterelles in my barley-mushroom soup (along with some dried porcini mushrooms), and in sautés like the following one. Here is a recipe that I originally developed for my Vegan Feast newsletter last fall, using oyster mushrooms and my homemade seitan "chicken" cutlets, but it is equally delicious with my "Breast of Tofu"(which is in almost all of my cookbooks and the recipe is here), or frozen Chinese vegetarian "chicken" cutlets, instead of seitan, and chanterelles instead of oyster mushrooms. 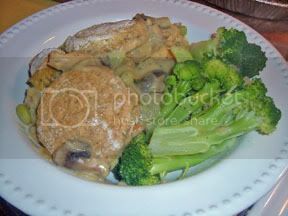 Forget that old recipe using canned cream of mushroom soup-- this vegan recipe is truly elegant. Serve with brown basmati or jasmine rice, potatoes, or eggless noodles. 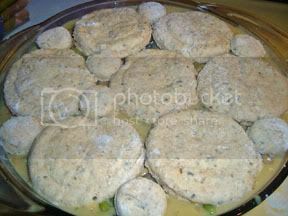 Dredge the cutlets in the Seasoned Flour. Brown them in a large nonstick pan in the olive oil over medium heat. 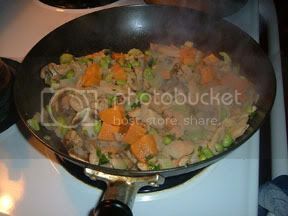 Remove the cutlets and add the green onion-- saute briefly. Add the mushrooms and steam-fry-saute adding the 1/2 c. broth as you stir. Add the sherry and boil 1 minute. Add the tofu/soy milk mixture and the last 1/2 cup of broth. Add the parsley, nutmeg, a few drops of lemon juice and the dissolved cornstarch. Cook over high heat, stirring, just until it thickens a bit. 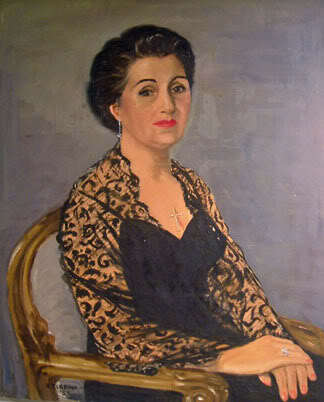 The above picture is a portrait of my Peruvian (paternal) grandmother, Clotilde Roncagliolo de Urbina, painted in the 1950's by my mother, Eve Tonge Urbina. I have it hanging on my wall, but one of my Peruvian cousins recently asked for a copy of it, which is why I took a photo of it. My mother was a professional portrait artist and her father, Gilbert Tonge, was a well-known California artist and muralist. Spice Island Vegan, who has met my mother, wondered what my mother looked like when she was young (see photo of her now, at age 88), so I'm adding (Sept. 25) a photo I came across recently of the Urbinas when my family visited Peru in 1954. I believe this was taken at Christmas. My parents are on far right of the picture, my father, Alejandro, standing, and my mother sitting in front of him (she's very obviously the non-Peruvian!). 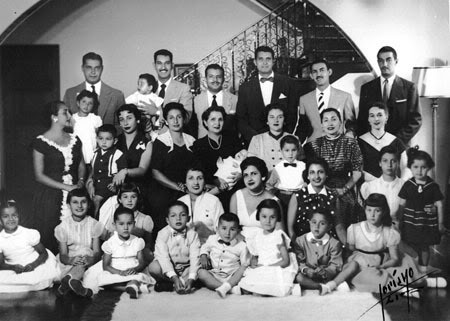 My grandmother is in the very center, holding a baby (I don't know who this was). I (age 6) am in the second row, third from the left, with barrettes in my hair; my sister Karin (age 7) is in the first row, far right. 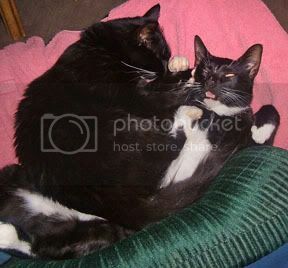 Our sister and brother kitties, Tina and Ringo. Ringo looks oh-so-dignified, doesn't he? This is a recipe from the Dec 04/Jan 05 Vegan Feast newsletter, but I used a biscuit topping-- actually, plain version of the scone dough I posted here. I used only 1 T. sugar, and no additions except a tsp. of dried basil. The filling consists of SoyCurls, which are tender TVP-like morsels made from the whole soybeans (and they really have the taste and texture of chicken), with a creamy gravy, green soybeans, sweet potato, etc.. The original recipe calls for fennel and leeks, but I didn't have any, so I used celery and onion. It was still good! Actually, my husband goes nuts over it! 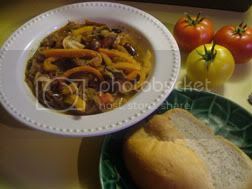 This is a recipe from the Oct/Nov 04 Vegan Feast newsletter, but you don't really need a recipe. I happened to be making pizza that day, so I made extra dough just to make this with some organic grapes I was given. It's one of my favorite Autumn treats! 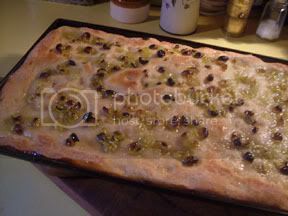 Basically, use your favorite pizza or focaccia dough (if you use pizza dough, make it thicker than a pizza), let it rise for 1/2 an hour in the pan, then "dimple" the dough with your finger tips and place grapes on top (green or red, preferably seedless). I squish the grapes in my hands a bit to make them exude their juice. Then sprinkle with sugar-- it can be coarse if you like. Bake at 400 degrees F for about 25 minutes. Eat hot...yum! This was a real spur-of-the-moment thing. I just sauteed a sliced onion, orange bell pepper, yellow bell pepper, a few mushrooms, lots of garlic, and two sliced Tofurkey Italian Veggie Sausages in a little olive oil with 4 medium garden-fresh tomatoes (two red and two yellow). I simmered it for about 10 minutes. I added about 1/2 cup of dry red wine, a handful of fresh basil, and salt and pepper. At the last minute I added some sliced sundried tomatoes and kalamata olives, but I think that was overkill. It was actually a bit too rich-tasting! The leftovers made a geat bruschetta topping, though! 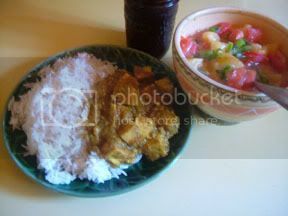 Red lentil and Tofu Curry with a sort of Indian-style "salsa". 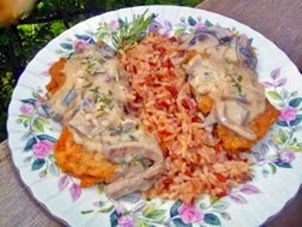 This was a recipe I copied down from a June 1999 Gourmet magazine a long time ago and always meant to try. It was pretty quick to make, and I served it with basmati rice and a sort of Indian "salsa" made from red and yellow diced tomatoes from our garden, green onions, lemon juice, salt and pepper, and homemade plain soy yogurt (that was good!). The curry was pretty dull, so I jazzed it up as I went along. It was tasty in the end, and certainly cheap! Saute the onion, garlic, and ginger in the first T. oil until the onion is softened. Add to the red lentils, wit the water and first 1/2 tsp. salt in a saucepan. Bring to a boil, then simmer, uncovered, for about 20 minutes, or until the red lentils have softened. Meanwhile, heat the second T. of oil in a large nonstick skillet. Add the tofu and all of the spices (except the cinnamon stick). Sate until the tofu is coated with the spices. 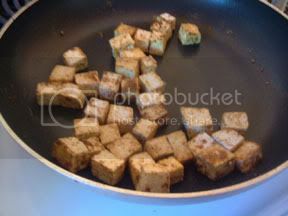 Stir the tofu into the lentil mixture and add the cinnamon stick. Simmer at medium heat, stirring often, until the mixture cooks down to a thick stew-like mixture, being careful not to let it scorch. remove the cinnamon stick and discard, and stir in the lemon juice before serving. This entry will be short and sweet (in more ways than one!). I had a glitch this morning with my camera software and just wasted 2 hours! Anyway, yesterday I tested this cake for the upcoming Vegan Feast Newsletter, which contains Thanksgiving and Christmas recipes, so I can't divulge the recipe. I've been wanting to do a vegan "tunnel cake" for a long time, and this seemed a good opportunity. It turned out really well! The pumpkin cake tastes richer than it really is, and it's moist and tender, not heavy. The "tunnel" is a ring of tangy lemon "creme cheeze" (homemade) with chunks of organic candied ginger. (I might make more of the filling next time for a bigger "tunnel".) I topped it off with a caramel sauce and toasted pecans. Divine! I plan to work on more vegan "tunnel cakes" in the future! See links to Variations and Updates of this recipe in the recipe below (versions made with hemp milk and oil; with the Vegg egg yolk replacer; and one with with no extracted oil). 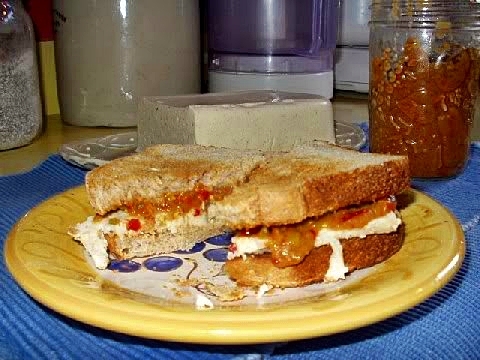 One of my "5 things that everyone should eat at least once before they die" from this entry was "a sandwich made with homemade white bread, vegan mayonnaise, a ripe tomato still warm from the garden (it HAS to be freshly-picked from a garden and NOT the hothouse variety), and a little salt". We are currently inundated with both red and yellow tomatoes, one of the few items that we (non-gardeners that we are!) cultivate every year. 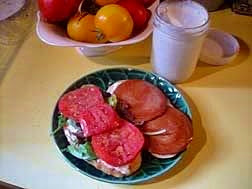 We savor as many sweet, juicy tomato sandwiches as we can before that sad day when our tomatoes are all used up, because we only eat tomato sandwiches with our own tomatoes, purists that we are! No store-bought tomato is ever as good as ours, and a tomato sandwich is basically about the tomatoes, so we just don't bother the rest of the year! Makes us savor them even more. Tomato sandwiches are very individual. I have mine as described above, sometimes on toasted bread and sometimes not; sometimes with lettuce and veggie bacon or soy bacon bits (stuck to the mayonnaise) (making it a BLT), sometimes not. My husband adds pepper-- I don't. And he NEVER uses lettuce--I do. I like more mayonnaise than he does, too-- LOTS of it. Since I don't want to ingest too much fat on my sandwich, I make my own low-fat vegan mayonnaise, recipe below (with miso and chili/garlic flax oil variations). To me, it tastes very like real mayonnaise. This morning I had a toasted vegan BLT for breakfast (why not? ), with, I swear, the sweetest tomato I have ever eaten! 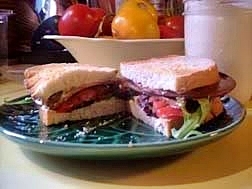 I used Italian bread and Yves Veggie Bacon (you could use LightLife Smart Bacon instead, or use organic soy bacon bits such as Frontier Bac'Uns). I didn't have any lettuce, so I used a modern touch-- organic baby greens mix. It was very satisfying. UPDATE: Try my homemade Tofu "Bacon". 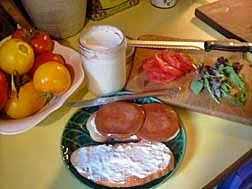 What's your favorite way of making a tomato sandwich? 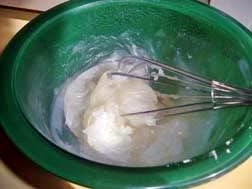 ...after the mayonnaise has set in the refrigerator for several hours, it should look like this. 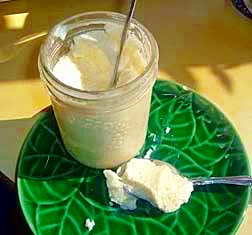 Then you whisk it in the jar to get the familiar creamy texture. PS: There's a hemp milk and hemp oil version here and a new version using The VEGG (powdered vegan egg yolk alternative), and another version, using no extracted oil. This is a revised version of the recipe that appears in several of my cookbooks. For those who are allergic to soy, do not like tofu mayonnaise, or the commercial "light" mayos (most are not vegan, anyway), here is a delicious (and inexpensive) solution! Four Hellman's fans of may acquaintance loved this (and were surprised that they did! 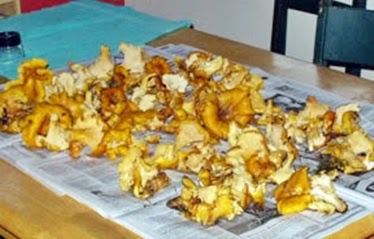 ).It contains a small amount of oil, just enough for good flavor and mouthfeel. It’s smooth and creamy, and a little tangy, but not too much. **BRIGHT IDEA-- This mayonnaise, with the addition of herbs, garlic, etc., can be used as a savory vegetable and toast topping. Note: If you leave out the agar in the basic recipe, this makes a good base for cold savory sauces. 4 tablespoons cornstarch (or wheat starch , which is GF, if you can't use corn-- do not substitute other starches! You can buy organic cornstarch in health food stores and online.) See below recipe for more information on these starches.NOTE: If the cooled-off mayo seems too thick or stiff to you, beat it with a whisk (you can do it right in the jar if you have a whisk that fits) until creamy. 1.) Place the Mix A ingredients into your blender jar and set aside. Tip: If you don't cook this thoroughly (and "translucent" is the key word-- meaning semitransparent), the mayo won't thicken properly.Tip #2: Make sure to scrape the bottom of the pot or bowl with the spatula, so that no starch mixture gets left at the behind. 4.) Pour into a clean pint jar, cover and refrigerate for several hours, until it is set. It should be firm enough to stand a knife up in. Keep refrigerated. Will keep for about 2 weeks. Nutrition facts were (using Living Cookbook software) calculated using my homemade soymilk and 1/4 cup olive oil. I calculated it using various kinds of nondairy milk and the nutrition facts are in this range no matter what you use (except for full-fat coconut milk). 21 calories a tablespoon is pretty darn good, considering regular mayonnaise (even vegan) contains about 100 calories per tablespoon! Nutrition Facts: (per tablespoon, using 1/4 cup oil in the recipe): Nutrition (per serving): 21.0 calories; 75% calories from fat; 1.8g total fat; 0.0mg cholesterol; 92.5mg sodium; 2.3mg potassium; 1.1g carbohydrates; 0.0g fiber; 0.1g sugar; 1.1g net carbs; 0.2g protein; 0.6 points. 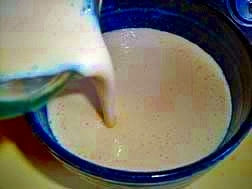 “SECRET BURGER SAUCE”: Mix to taste, Veggiennaise (already set and chilled), ketchup, and pickle relish; or you could use Veggiennaise, ketchup and mustard, or Veggienaise and a ketchup-style chili sauce. You can make tasty sandwich spreads by blending half vegan mayonnaise (blended but not set), and half grainy gourmet or creamy Dijon mustard (for a "Dijonnaise"), OR, for serious miso fans, light soy or chickpea miso. To make a delicious garlic dip for cold, steamed vegetables and artichokes, omit the dry mustard and add 4-6 peeled raw cloves of garlic while blending. This also makes a good spread for making garlic toast. Use dill pickle brine instead of plain vinegar. To the blended, but not set, mayonnaise, add 3/4 c. minced raw onion and 3/4 c. minced dill pickle. If you have no pickles, use chopped cucumber with dillweed and white wine vinegar to taste. Capers are optional, in my opinion. This dressing is a traditional addition to many deli sandwiches. 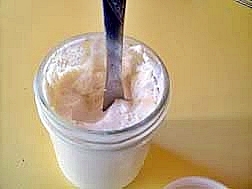 To the blended but not set mayonnaise, add 2 T. prepared horseradish, 2 tsp. vegetarian worcestershire sauce, 1/2 c. ketchup-style chile sauce, and 2 tsp. grated onion. Flavored mayonnaise can turn a quick sandwich or salad meals into a gourmet treat. Try these suggestions, and then invent your own. 1.) Use cranberry or other berry vinegar, or white balsamic, champagne, or sherry vinegar, or lime juice, instead of ordinary vinegar (or lemon juice). 2.) Use your favorite herbal vinegar plus 3 to 4 T. of the appropriate fresh herb. 9.) 1/4 c. or more minced fresh herbs, such as basil, mint, oregano, cilantro, tarragon, etc.. It's sunny and warm now, but it was chilly this morning, and I had a jones for scones, plus two oranges that needed using, plus a little basket of wild blackberries in the fridge, so I came up with this variation on my usual low-fat scone recipe. The recipe is low in fat because it only contains 1 Tbs. 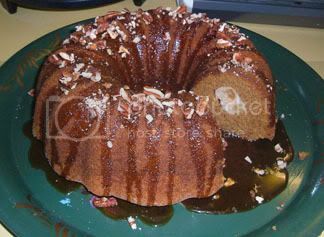 of oil (though the pecans and chocolate chips raise the fat level in this version! 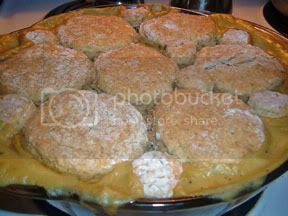 ), but the scones are nice and tender, due in part to the pastry flour. Try them-- they are yummy! This recipe only has 1 T. of oil in it, but the scones are light and tender. Pour this into the dry ingredients and mix lightly but thoroughly. Make slight indents in the dough with your finger where you want the berries to go and place a berry in each indent. Bake about 15 minutes, or until golden. Pull the scones apart and serve warm. What I made for lunch the other day-- I call them "Mediterranean Quesadillas". I had some grilled eggplant and zucchini, and some wholewheat tortillas, leftover from dinner the night before. I cut one tortilla in half and spread one half with Ajvar , a Balkan red pepper and eggplant spread (see more about this and a recipe below), and the other half with vegan mayonnaise (my low-fat version). Then I added the grilled veggies, plus roasted green peppers (you could use red ones) thin slices of smoked tofu , and fresh basil leaves. I put it together and cooked over medium heat in a nonstick pan until golden and crispy on both sides. Cut into wedges with a sharp knife . This will serve 1-2, depending on appetite. Have napkins handy! This delicious condiment is originally from Macedonia, Croatia, and Serbia, but is popular also in Albania, Greece, Bulgaria, Hungary, Turkey, etc., and all over the Middle East now, it seems. 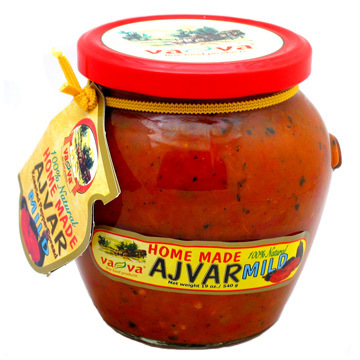 It is sometimes called "vegetable caviar", and there is hot ajvar and mild ajvar . In some areas they use roasted green peppers. Panini made with my homemade ajvar and vegan white "cheese", recipe in my book "World Vegan Feast". It also makes a great cracker spread or a dip. Serve it as an appetizer to spread on thick slices of country-style bread or flatbread such as pita or lavosh, or use it as a side dish. Or just use it like salsa. 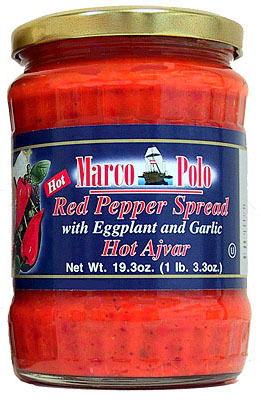 You can use it 0nrice or potatoes, or as a quick pasta sauce; or mix it in with hummous and other dips. It's used on grilled meats, so why not on grilled seitan or tofu? Or on some big Tofurkey or Field Roast veggie sausages? 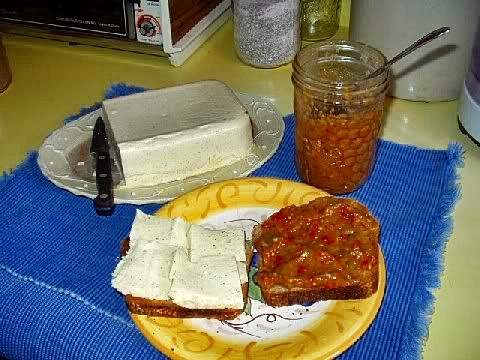 Or how about with white beans, veggie "meatloaf", "cheese" toast, or bruschetta? Spice Island Vegan used it with my tofu fritatta from "Nonna's Italian Kitchen " and it would be good on scrambled tofu, or vegan omelets, too . Many Balkan families can their own supplies of it every year, but I can't find anything specific about canning it. I read that green beans and unripe tomatoes are sometimes mixed in with the ajvar before canning. All the canning sites I consulted warn against canning any pureed vegetables because of the problem of getting the temperature up high enough in the center of a jar of pureed food without commercial equipment. Perhaps if you made it very chunky you could pressure can it in small jars (1/2 pint) and then puree it after opening. I did read that you can freeze it, too. Pronounced Eye-vahr, this is a name of Turkish origin given to a popular Balkan spread or relish made of roasted peppers and eggplant (and sometimes other vegetables, too). Fresh ajvar is always made during the late summer and early autumn, just after the pepper harvest, when many Balkan households also can or bottle their own ajvar for use throughout the year. You can make it as mild or spicy as you like! I can get this in my area in jars, fairly cheaply (about $4.00 Cnd a jar), but I like the idea of doing my own seasoning, and it’s very easy to make! NOTE: My husband didn’t care for the what-I-would-call-“silky” texture of this ajvar, but then, he doesn’t really like eggplant. I have noted below that you can use more pepper and less eggplant if you like, but see also the zucchini variation below, which he preferred. Preheat oven to 425 degrees F. Place the peppers on a baking sheet and the eggplant on another. Poke the vegetables in a few places with a large fork. Roast the vegetables until they are somewhat charred on the outside and soft inside—the peppers will, of course, soften faster than the eggplant. Place the veggies inside a closed paper bag for 10 minutes or so— this will help loosen the skins. This is a messy job, but quick—the skins should just peel away—it’s okay if a bit of pepper skin gets left behind. Remove the stems, and the seeds of the peppers. Rinse the peppers. Chop everything coarsely and then pulse in a food processor to the texture you like. Set aside. On a small plate, mash the garlic with the salt with the back of a spoon til it is paste-like. In a large skillet, heat the oil a bit, then add the veggies, the salt and garlic, vinegar, lemon juice, hot sauce and fresh pepper to taste. Simmer the mixture until it has thickened a bit (it will thicken in the jar, too, so don’t cook it down too much). Taste for salt, pepper and hot sauce. ZUCCHINI AJVAR: Omit the eggplant and use a chunk of large zucchini (this is a good way to use those overgrown ones!) about the size of a medium eggplant. (NOTE: you can use 4 red peppers and a slightly smaller chunk of zucchini if you prefer—it will be redder in color that way.) Otherwise, proceed as for the recipe above. I found that it needed about 1/2 tsp. more salt when using the zucchini, for some reason.